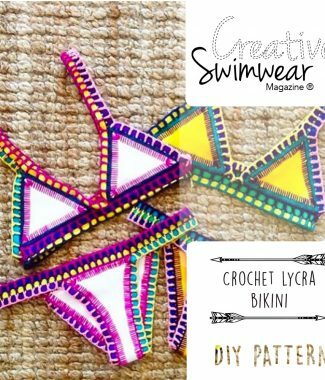 How to grade Crochet Bikinis - Creative Swimwear Magazine and Trends ! Crochet bikinis are quite easy to grade up or down, but many people find it very hard to do so. Most of the crochet bikini patterns don’t offer explanations for all the sizes, even more if you need XXL sizes. So how do I grade crochet bikinis? The bikini tops are very easy to grade up, normally if is a triangle top or if it has double crochet repeated rows, you can just add a few more rows in order to get one or two sizes up. It’s normally enough to add 2 rows of DC from a Small to a Medium, or if you have a different pattern, add 2 cm on the width and 1 cm on the height. You can calculate how many stitches referring to the gauge of the pattern you are making, most of the crochet tutorials have a gauge at the beginning . If your’re working on a crochet halter top with a lace design in the middle (image 2) the grading will happen just on the triangles and the first row that should have 4 cm more on it’s width from a small to a medium. In the magazine Creative Swimwear, the drawing explains the grading for the bottoms, using this diagram and combining it with your gauge you can size your patterns up or down. You can do it by measuring how many stitches and rows you need to make 1 cm of crochet with the ruler on the piece you have ready. To make one size up for a bottom you know you need 1 cm each side and 2 cm on height. So add the number of stitches necessary to make 2 more cm on the front and 2 more on the back, and the number of rows needed to add 2 cm of height, for the height is good to add 0.5cm on the top 1 cm in the middle of the legs and 0.5 cm on the top of the back of the bottom. You can apply the same formula to the tops to calculate stitches and rows. This is an easy way to calculate it, because you’re using your own gauge to size the bikini up or down, gauges can vary a lot depending on the yarn weight and the hooks you are using to make your swimwear, so calculating your own sizing it’s going to give you more precise sizes and no mistakes on your orders. If you have bottoms with side ties, sizing is not a big problem because the person can always open the tie strings more or less when trying them on. You can find the diagrams in our Creative Swimwear magazine number 1.